This Inn known by the name and sign of the Good Intent was built in part in the 13th year of the reign of George 11 in 1740, though the original structure has been altered and added to over the years. When first built the property was a farm dwelling owned by Robert Gregory Esq., who held the titles of mortgages on lands and properties in East and West Farleigh, and in the town of Maidstone. He possessed this house with its land as part of his estate until his death in 1767, whereafter by the terms of his will it passed to his son Ralph, yeoman of Maidstone, who in 1769, after disposing of a parcel of arable land and a parcel of woodland belonging to the house he sold it to one Isaac Stone, wheelwright of West Farleigh. Stones father Samuel had been a land steward or bailiff to the Gregory estate in 1703. Isaac Stone resided with his family and conducted his trade from the house until his death in 1781. His wife Marie or the widow Stone, as she is described, inherited the house by the terms of her husband’s will. She remained here until 1785, during which time she is recorded as a harness maker. In 1785 she sold the house and a tract of land totalling two and half acres to Benjamin Shadgett, a carpenter of Loose. He resided here with his family, a wife Ann and seven children until 1796. In that year he sold the house to his brother Stephen, a seed crusher and corn merchant of Loose. In 1801, he applied for and was granted a licence to sell ales from the premises, which at this date bore no other title other than it was an ale house, at the green West Farleigh and that Stephen Shadgett, a seed crusher and corn merchant and now an ale retailer, was of that house and held its restrictive licence, He kept the house until 1820, and in that year sold it to Richard Elgar, a general dealer and beer retailer of East Farleigh. In 1823, he was fined 10 pounds for keeping and concealing certain pots or jugs of illegal measure. In the same year he was presented to Magistrates again and ordered that all his pots carry the County stamp upon them. He was fined 20 shillings on this occasion. In 1827, Elgar sold the house to John Randall, a joiner and builder of Loose. He remained here until 1836, selling in that year to Thomas Larkin, beer retailer of Maidstone, he had owned a beer house in Stone Street, Maidstone. Two years after purchasing the house he registered it under the title of the “Good Intent” the origin of which refers to a gun vessel of His Majesty’s Fleet that was built at Sheerness in 1790. It was in action until 1793, when it was captured by the French off Corsica. It was recaptured by the British in the spring of 1794 and was in service until 1796, in which year it was badly damaged. After some measure of repair it again saw service, however in 1801, it was brought back to England and broken up. Thomas Larkin kept the house until his death in 1845, whereafter his son Stephen took up the licence, staying until 1856, when in that year he sold it to Samuel Hickmott. His family owned the “Castle” in Week Street, Maidstone, the “Kings Arms” Boxley, and the “Wheatsheaf” in Loose Road, Maidstone. In 1866 he sold the “Good Intent” to Nicholas Paramour, beer retailer and saddler of Loose. He ran the house and operated a saddlery from it until 1878. 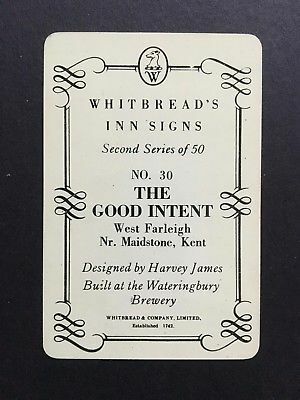 In 1878 he sold the “Good Intent” to Alfred Leney, brewer of the Phoenix Brewery, Wateringbury. They in that year installed one Edward Boorman as keeper of the house, at an annual rent of 18 pounds. He kept the house and carried out a harness making business, from the premises until the year 1890, when he was succeeded by Robert Wright, beer retailer of Pudding Lane, Maidstone. He had kept a beer house there for many years. He kept the “Good Intent” until his death in 1898, whereafter his son Arthur was granted the tenancy and a transfer of licence. Arthur Wright remained here until 1912, handing over in that year to Richard Fuller, beer retailer and carpenter of West Farleigh. He stayed in the house until 1918 and was succeeded by Ernest Cheeseman, beer retailer, builder, plasterer and decorator of West Farleigh. He remained here until 1932, when one Albert Leonard Pettitt took over, staying for many years to follow. In 1949 the house was granted a full licence and shortly after, became a Whitbread House to be run by William Crittenden and his wife Molly who, with their family remained here for many years until 1985, when Pat Donoghue took over the premises licence. He undertook a full refurbishment of the trade area of the “Good Intent” assisted by Whitbread Brewery. He remained at the house with his wife Diane and their daughter and two sons until transferring the remainder of their lease to Derrick Draper in 1996, a solicitor from London, who remained here for twelve years with his wife Linda and two of their four daughters. 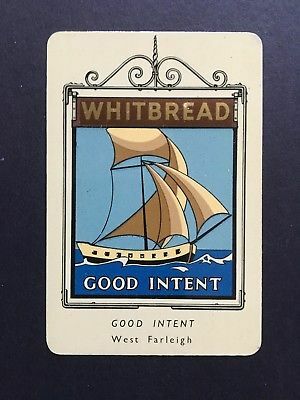 During this time the house was sold by Whitbread Brewery into a property company known as “Laurel “which after a brief period resold the property to Admiral Taverns. In 2008 Derrick sold his lease to Lesley and Terry Needham who, along with their two sons run the house for two years up until December 2010, when the transfer of lease was passed to Stephen Millsom, a former Golf Course Manager and native son of West Farleigh, having resided in Kettle Lane from birth to the age of 19. Stephen first entered the “Good Intent” with his father, as a young child, during the stay of William (Bill) Crittenden. He remains here to this day running the still Admiral Taverns pub with his partner Pauline, a chef by trade and her son Ben.